Oh so many questions . . .
One Thing's For Sure . . .
A Couple of David Lynch Books . . .
Twenty Years Ago This Month . . . I am thrilled about the upcoming Twin Peaks episode of Psych. I'm sure those few of you who still checking my blog have already seen the many cool photos from the episode online. If not, head on over to Dugpa.com right now! I love that close-up shot Dana Ashbrook crying over the body; he really seems to be channeling Ray Wise there. And while many people are commenting on how good Sherilyn Fenn looks, I'm thrilled to see Catherine Coulson back as "The Woman with Wood." She's looking as good as ever! The extended episode of Psych (complete with a Julee Cruise opening song) airs December 1. To celebrate the 20th anniversary of Twin Peaks, Leeds-based arts entrepreneurs Micheale Spessa and Dave Lynch (what are the odds?) present Fire Walk With Me, an opportunity to immerse yourself in Twin Peaks madness. The event will be held on 18th September 2010, bringing together fans from across the globe. Fire Walk With Me is being held at the appropriately atmospheric Grade 1 listed Temple Works in Leeds; the building has a history and ambience that would no doubt inspire David Lynch. Not surprisingly the organisers are remaining tight lipped as to the whereabouts of Bob, if you have spotted him recently or any other Twin Peaks characters then do let them know. Tickets on sale now via the website http://www.firewalkwithme.co.uk/ and cost £12 online, or £15 on the door. Group concessions apply. Sign up to the website, http://www.firewalkwithme.co.uk/ or check out Twin Peaks Freaks www.twitter.com/twinpeaksfreaks to discover more about the event. Remember the Owls are not what they seem. Sometimes it takes the right message to get me blogging again. I've been pretty lazy lately. Sorry about that. I guess I need some good inspiration to get me writing again. I'm working on finding it . . . .
For those of you who may have wondered, yes I'm still here. I'll admit, I've been quite neglectful about posting. What can I say? My mind has been elsewhere. For now, here's a very quick update about things I've read and seen. I truly do hope to resume more significant posts in the future. I'm currently reading The Passage, by Justin Cronin. It does live up to the hype. I'm totally engrossed, up late turning pages. This is a good thing. I've been looking for a book this absorbing for some time now. That's not to say that some of my recent reads haven't been good. In fact, I've read some superb books, including Kraken by China Mieville and The Windup Girl by Paulo Bacigalupi; both are excellent, if dense and demanding, books. I haven't been to many movies but I did see Toy Story 3 and was tremendously impressed. This was nearly a perfect movie and one that worked on many levels. I think that the Toy Story trilogy may be one of the best film trilogies of all time -- none of the films is weak, and each sequel builds upon the past to make a satisfying whole. I hope there will never be another Toy Story film; the story is complete and very satisfying. Bravo to Pixar for another amazing film! There have been many, many good things on TV. Too many, really, to list in any detail. Special mention, however, goes to Treme on HBO. The series started slow and seemed, at times, to wander a bit. But in the end the show proved to be one of the most sophisticated pieces of television entertainment I've ever seen. Superbly written, directed and acted, Treme was an intricate and meticulous study of people coping with the aftermath of Hurricane Katrina, one of the worst disasters in United States history. Wonderful reviews have been written about the series, most better than anything I could do here. One of the best was this one by Myles McNutt. Go read it. I wish I could write more but other commitments are pulling me away. I hope to post again soon. There, no more LOST from me. Promise. The following is pretty much right off the top of my head. These are my first reactions to the end of LOST and the totality of the series so there may be some clumsy wording (and analysis) ahead. The LOST finale clearly worked on an emotional level. It hit all the right buttons as characters were dramatically reunited. But, hey, that's what LOST has been doing since season one: separating its characters and then reuniting them. The formula always provided an emotional punch: a tear in the eye and a lump in the throat. And so, in the end, we got that all over again. Only this time, dead characters were allowed in on the reunion. (Yes, I know, technically all the characters who reunited did so after death; but for awhile there during the finale the show played as if the dead characters were "coming back to life" in this "alternate" universe). Bottom line? The LOST finale was one big emotional reunion. And it worked. Yes, indeed. But did it work on an intellectual level? Well, I think here the show was clearly lacking. From the beginning, LOST has played like a mystery ("Guys, where are we?") Outside agents--external forces--were threatening our lead characters. We (and the characters) didn't know who was doing what or why. But we were promised answers. Oh, yes, we were promised. The producers promised answers. The network, with its constant barrage of promos, promised answers. Heck, even the characters regularly professed to have answers. And yet, I hardly think the answers we got were satisfying. Why? Well, they weren't answers to the mysteries that fueled the story. Sure, some might argue that those kinds of answers weren't important--that it doesn't matter if we know what the underground wheel was, or why turning it moved the island in time or provided transport off the island (to Tunisia, of all places). It doesn't matter why Walt was important, or how the giant statue came to be built on the island, or why the timer in the hatch flipped to Egyptian hieroglyphics. These questions don't matter because the story was never really about these mysteries; it was, instead, about the characters and their need to "find" themselves in one another. Fine. I can buy that. But I would also argue that the narrative never became sophisticated enough to place those internal character struggles firmly and satisfyingly in the foreground. Time and again, LOST relied on a surface narrative--an urgent, concrete conflict--to provide momentum. Any story about character insight or revelation usually felt tagged-on. In the end I don't think LOST lived up to its promise. There was something hollow about it, something missing. Still, I'll miss the show. It was compelling and exciting and extremely well-made. And I have to say, I was engaged with it to the very end. But while it kept me guessing for six years, I don't believe it will keep me thinking for nearly as long.
. . . when you get out of the habit of writing on your blog, it is easy to stay out of the habit. Will we ever see any of the "kids" again? I'm holding out hope that the various children of the Lost universe will make a dramatic re-appearance by season's end. I can picture Penny sailing up to the island with Walt, Aaron, Charlie and Ji Yeon all on board. Clearly, these kids had something special about them, right? I still demand to know what the deal was with Walt. And there was mystery about Aaron, too. C'mon Lost writers, don't leave us hanging! Will the Jacob/Man-In-Black backstory (airing tonight, 5/11/10) fill in enough blanks? I want to know about the bodies in the cave! About Alvar Hanso! About the big statue and the other ruins on the island! I want to know why Ben could summon the smoke monster! I want to know why the monster appeared in so many other forms (Kate's horse, anybody?) Time is running out, and it sure seems like there is a lot left to explain! Will the show come through? We'll see . . .
“When we shot [Sheryl Lee] it was cold—I mean, it was so cold. And she lay out there, and then we’d have to take her away, where they had these blankets and heaters set up behind this giant log. So she’d run fifteen and go into this warm little tent and get her body temperature back up, and then go back and shoot. She was a great sport” – David Lynch, Lynch on Lynch (ed. by Chris Rodley), p. 172. “I asked [David Lynch] if the Twin Peaks pilot would be get picked up [as a network series] today. ‘I kind of doubt it,’ he replied.” – Tad Friend, “Creative Differences,” The New Yorker, 9/6/99, p. 67. Well, I've been out of touch for some time and I apologize. I've started watching Justified on FX. The series features smart writing, atypical storylines, and a fine lead actor, Timothy Olyphant, who is superb in the role of Raylan Givens. Justified has been a pleasant surprise. The Pacific on HBO is also another riveting series. Clearly, a great amount of time, effort, and money has been put into the series. It shows--the production values are present in every scene. But, at the core, the fine writing and acting are what give the show its emotional resonance. I don't watch Caprica. I stopped watching FlashForward. I was disappointed with Big Love (the last season was rushed and hectic, and far less engrossing than seasons past). But I tell you, I can't wait for Treme from David Simon. It starts Sunday on HBO. If it is half as good as The Wire it will be the best show on TV. I never thought a comic with the title, Scalped, would appeal to me, but the Vertigo series from writer Jason Aaron (and illustrated, for the most part, by R.M. Guera) is one of the most complex, compelling and captivating comics I've ever read. The story is essentially a crime drama set on the modern-day Prairie Rose Indian Reservation in South Dakota. The FBI has placed an undercover agent, Dashiel Bad Horse, into the crime operation of Chief Red Crow. There are murders, drug deals and double-crosses. No one is completely innocent; no one is completely bad. I've finished the five graphic novels of Scalped (collecting issues 1-29) and I may have to buy all the subsequent issues before the next collection comes out. I'm hooked -- immersed in the wonderfully-plotted story and thoroughly-developed world Aaron has created. He is masterfully using the strengths of the comic medium: devoting time to flashbacks, overlapping simultaneous storylines from issue-to-issue, and developing his background characters into significant players. Aaron is not beholden to any formulaic story structure. He pauses his story sometimes, suspending the major narrative for five or six issues to explore a side area of his milieu. But nothing in the series is extraneous or out-of-place. The pieces all come together. Trust me, Scalped is a rewarding series. I've been reading quite a bit. The most exciting book has been Although Of Course You End Up Becoming Yourself by David Lipsky. This is essentially a book-length interview Lipsky did with David Foster Wallace in February of 1996, just as Infinite Jest was published. Lipsky was assigned by Rolling Stone to profile Wallace but his piece never made it to print. Lipsky, however, had taped virtually every waking moment of his five-day visit with Wallace, and those tapes are transcribed here. What an amazing book! I found myself highlighting sections and taking notes. Wallace discusses films, authors, TV and movies. Though the book is rather dated (they talk about some stuff that has virtually been forgotten by now) there are some sections that are invaluable to the Wallace scholar, particularly those sections about the writing, editing and publishing of Infinite Jest. Wallace emphasizes over and over again how hard he worked on the book and compares the end of the experience (before he knew it was to be published or well-received) to a really good physical work-out: "There's this kind of tiredness that's real pleasant, and it's real sort of placid." Wallace knew that IJ was good and clearly the book was a transformative experience for him. Lipsky's book is revelatory and no fan of David Foster Wallace should miss it. Sorry for the extended time away from the blog. The real world has a way of intruding on my free time! Ah, well, onto exciting news! The Harry Ransom Center at the University of Texas at Austin has acquired the papers of the late David Foster Wallace. Included in the archive are manuscripts (handwritten pages from Infinite Jest! 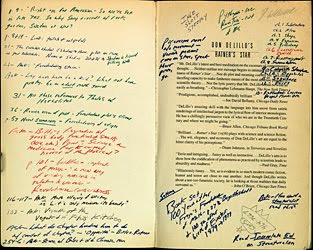 ), annotated books that Wallace read over the years (including books by Don Delillo and Cormac McCarthy! ), copies of Wallace's heavily used reference books including his dictionary (containing numerous circled words), personal and professional letters, and loads of other fascinating material. Check out the Harry Ransom Center website to see samples of the materials mentioned above. If you are Wallace fan, this is a must! And coming soon: draft material from Wallace's unfinished novel, The Pale King. These pages will not be available to the public until after the book is published in April 2011. It is going to be a long year. In fact, most of the archive won't be available to the public until the fall of 2010. Meanwhile, a selection of Wallace's material is on display on the Ransom Center lobby through April 9. You know what? I think I'll try heading down to Austin next week. I can't pass up this opportunity! I've been meaning to comment on a number of things but I've been busier than usual. Soon, however, I hope to talk about some recent comics, books and TV. I was in Half-Price Books and came across a couple of David Lynch books that I didn't have. The first was a 2007 British book, David Lynch, by Colin Odell and Michelle Le Blanc. 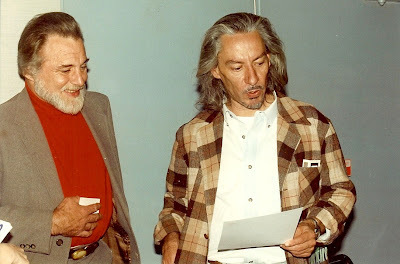 The book appears to contain the standard Lynch overview: chapters about each significant Lynch project, from the short films all the way up through INLAND EMPIRE. 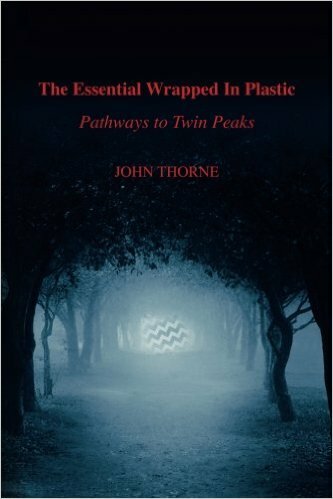 The book also has a couple of potentially intriguing chapters with titles such as "There's Always Music in the Air - David Lynch and Sound in Cinema"; "Pretty as a Picture - David Lynch's Visual Style"; and "Unlock the Dream, Solve the Crime - Mysteries and Secrets." A quick check of the endnotes and bibliography reveals that the authors used Wrapped In Plastic as one of their sources. Oddly, they apparently had access to only one year of WIP, listing issues 12-18 (and no others) as source materials. The second book is a recent release, David Lynch Interviews, edited by Richard A. Barney. It was published just a few months ago (November 2009). From a quick perusal, Interviews looks to be a valuable addition to my Lynch library. Barney has managed to collect a number of unusual and hard-to-find Lynch interviews and articles from the past 30 years. From a 1977 interview in Soho Weekly News to a 2008 unpublished interview (conducted by Barney), Interviews also features a couple of rare French interviews translated into English for the first time, the transcript of the Cannes Fire Walk With Me press conference, a transcript of Lynch's 1997 KCRW Morning Becomes Eclectic interview and many others from various magazines and websites. Interviews appears to a worthwhile and important Lynch book. That's all for now. But check Craig Miller's blog entries over at http://www.wrappedinplastic.com/ for some interesting reading. Craig has just put up a great essay about David Foster Wallace and he informs me that he will be posting new material as often as time permits! A few months ago I wrote about the new Batwoman story featured in Detective Comics and about the stunning artwork by J. H. Williams III. In Detective, Williams has been consistently creating amazing double-page spreads, finding new and unusual ways to play with the medium, to create visuals that both enhance and complement the story. "Williams' art tells a story in tandem with but also independent of [Greg] Rucka's words. It's free to run ahead of the plot, giving away secrets or even undercutting the dialogue for a deeper total effect. To say that Williams' art is merely good-looking or well-designed is to deny how truly unique it is, not so much inhabiting narrative space as invading it[.]" I couldn't agree more. I love this art and I've often wondered, while reading Detective Comics, if original pieces would ever be available for sale. Turns out, Williams sells many of pages on his blog. 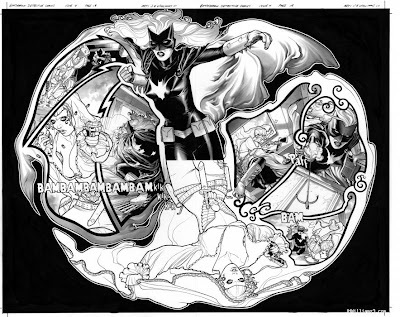 There's a wonderful symmetry to this piece, beyond the contrasting figures of Batwoman on top and Alice on bottom. Notice, first, how the two capes extend to create three unique panels on each side of the picture. Batwoman's cape creates jagged, sharp panels; Alice's produces soft, dreamy ones. The shapes of these panels have, throughout earlier issues of the story, reflected the natures of both women: Batwoman is a character of action and discipline; Alice is a figure of violence and insanity. Here, on one page, they are presented in direct contrast to one another. The symmetry of the panels extends to their contents, as well. Alice dominates on the left (in Batwoman's panels). She points her gun at an alarmed Batwoman (panel 1). She shoots until her bullets are gone (panel 2). Under fire, Batwoman crouches to protect herself (panel 3). Then, as the flow of the story moves to the right, the action shifts. Now, Batwoman dominates (in Alice's panels): She prepares to attack while Alice turns to flee (panel 4). She fires her gun (here, it is not a weapon of death, but a tool to attempt capture) (panel 5). Finally, she pursues a fleeing Alice (panel 6). Each panel on the spread is distinctly complemented by one on the opposite side. Beautiful. I love this page: It represents a significant moment in the Batwoman/Alice arc; a critical piece of a larger whole. And yet it also manages to stand on its own. Yes, there is much that takes place before and after these two pages, but, even without the rest of the story, you can sense the larger narrative condensed here in one single sequence. Williams and writer, Greg Rucka, have done some great work in Detective Comics. In fact, their Batwoman story has been so popular, the character will soon have a title of her own. If you're looking for a good super-hero story with superior art, I highly recommend you check it out. 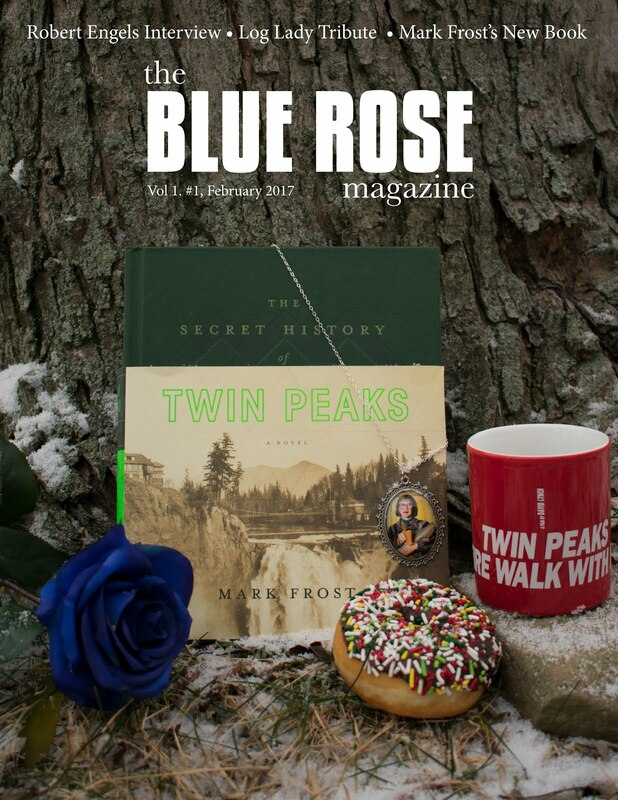 "The two hour Twin Peaks movie, populated by an ensemble cast of 16 is the first TV masterpiece of the '90s and the best drama to come our way since Hill Street [Blues] floored critics and reviewers in January 1981. Dark, deceptive, visual, and, of course, quirky, it spellbinds from the very first minute -- make that the first second." Well, I was excited. Ed Bark was describing something magnificent and new, something startling and unique, something not-to-be-missed. I knew I had to see Twin Peaks. You see, I was always a fan of good TV and two decades ago good TV--and by that I mean something intelligent, complex and challenging--was a rarity. The best television series to date had been St. Elsewhere. There was also Hill Street Blues and the early episodes of Miami Vice. But really, there was very little that made you sit up and take notice. Clearly something special was on the way. Ed Bark ended his column by saying, "Much more will be written about Twin Peaks before it emboldens prime time as no series since Hill Street. Circle March [the tentative broadcast month for the pilot] on your calendar and savor the prospect of further details." Well, in a figurative sense, I did "circle the month." I took Bark's column home and placed it prominently on my desk. I was not going to forget Twin Peaks. And I didn't. I watched (and videotaped) the pilot episode when it premiered on April 8, 1990. Then I watched it again the next day. Like Ed Bark, I was bowled over. It was the greatest thing I'd ever seen on TV. (Still is, actually.) And Bark was right; much more was written about Twin Peaks (albeit after it aired). In fact, much of that writing appeared in the pages of Wrapped In Plastic, produced by Craig Miller and myself. Not surprisingly, I'm still writing about Twin Peaks today. And I hope in 2010 to write about it a little bit more. Make no mistake; this blog will still be home to reviews of all sorts of books, comics, TV, films and other assorted stuff that sparks my interest. But in this twentieth anniversary year of Twin Peaks I think I have a few fun things about Peaks to share. Anyway, that's the story of how I first heard about Twin Peaks. So tell me, when did you first hear about it? 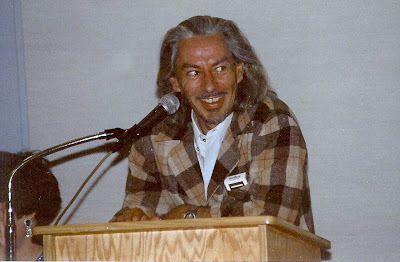 I've had a request to see some pictures of Frank Silva, the actor who played Killer Bob in Twin Peaks and Fire Walk With Me. I took these pictures of Silva when I met him in 1993 at the annual Twin Peaks festival in Snoqualmie Falls, Issaquah and North Bend, WA. Craig Miller and I had the opportunity to interview Silva at length and we published this interview in Wrapped In Plastic 8. It was one of the few interviews Silva did and certainly the most extensive. Silva was a gentle, friendly, soft-spoken man. He was quite approachable and seemed bemused, if not slightly overwhelmed, by all the attention he was given at the festival. I'll never forget when I first saw him. It was Friday night and the festival banquet at the Issaquah Holiday Inn had begun. People were sitting and eating, eyes focused on a table at the front of the room where guests Al Strobel (Mike, the one-armed man) and Jan D'Arcy (Sylvia Horne) and others were seated. Rumor was that Frank was coming but that he was running late. Would he get there in time for the banquet? No one knew. I was fortunate to be sitting at the front of the room where I could see the entrance. We had finished dinner and had listened to various speakers and it seemed like the banquet might be winding down. 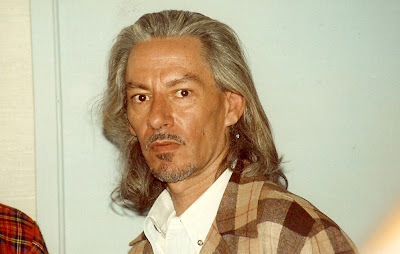 Then I saw Frank Silva appear. The response in the room was electric. The man who played Bob was here! Silva took the podium and recounted us with great tales from the set of Twin Peaks and Fire Walk With Me. It was surreal. I was sitting a few feet from him and was instantly captivated by the man who played the forceful, frightening and indelible Bob. But nothing could compare to the moment when Frank gave us a live performance of Bob: He bent his head back and laughed/screamed. He went all out. It was a roar! It was piercing! It sent shivers down my spine! The next day, Frank was due to appear at another Festival event in Snoqualmie Falls. He had missed his ride from Issaquah and my wife and I offered to give him a lift. 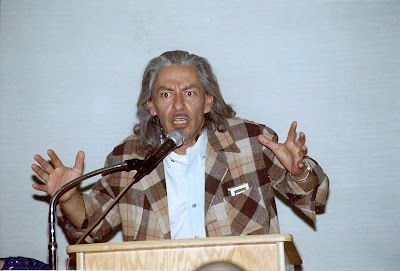 For the next half-hour we had Frank Silva chatting away in our car, commenting on the time he spent in the area during the filming of the Twin Peaks pilot and Fire Walk With Me. He pointed out places where they shot. He told us about working with David Lynch. He seemed to be truly enjoying himself. 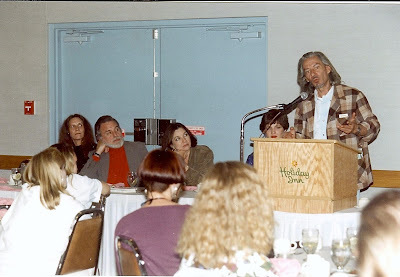 We said good-bye to Frank Silva later that day. We hoped he might return to future Twin Peaks festivals, but it was not be. His visit in 1993 was his first and last. 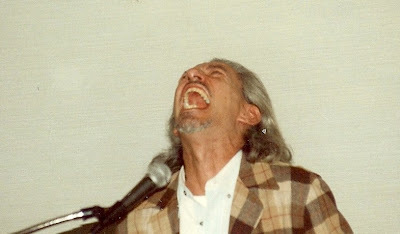 Frank Silva died on September 13, 1995. While many Twin Peaks fans would never get the chance to meet Frank and see, for themselves, what a kind and caring man he was, they will always be able to look at his stupendous, visceral performance in the series and the film. 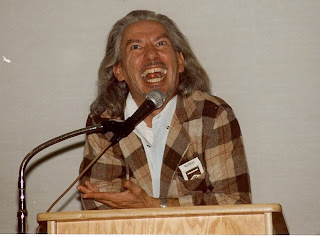 Frank Silva will forever be the chilling, inexorable BOB.